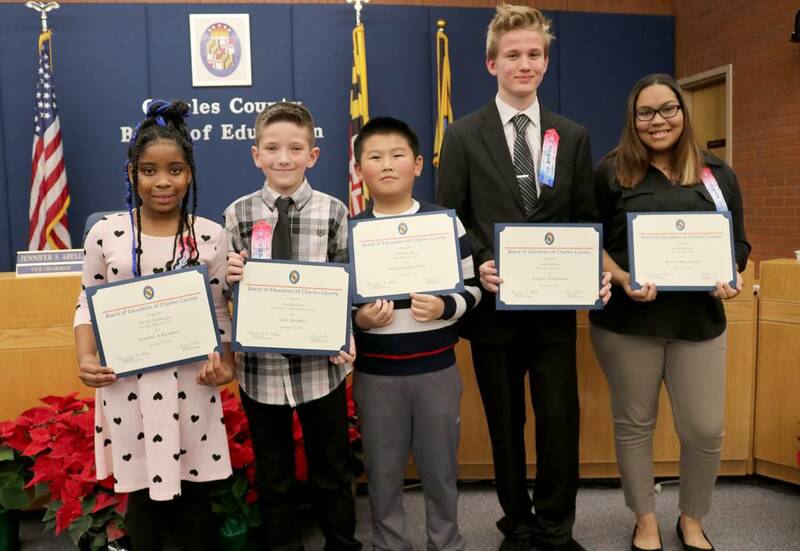 The Board of Education at its Dec. 11 meeting honored five Charles County Public Schools (CCPS) students for exemplary accomplishments in the area of academic achievement, career readiness and personal responsibility. Honored, from left, were Tre'Joir Washington, third-grade student at Eva Turner Elementary School; Anthony Cave, fifth-grade student at Dr. Thomas L. Higdon Elementary School; Brandon Lin, fifth-grade student at Berry Elementary School; Steven McPhee, eighth-grade student at Piccowaxen Middle School; and Ja'Nae Pickeral, a senior at La Plata High School. LA PLATA, Md.—The Board of Education at its Dec. 11 meeting honored five Charles County Public Schools (CCPS) students for exemplary accomplishments in the areas of academic achievement, career readiness and personal responsibility. Honored before the Board were Anthony Cave, fifth-grade student at Dr. Thomas L. Higdon Elementary School; Brandon Lin, fifth-grade student at Berry Elementary School; Steven McPhee, eighth-grade student at Piccowaxen Middle School; Ja'Nae Pickeral, senior, La Plata High School; and Tre'Joir Washington, third-grade student at Eva Turner Elementary School. Cave was honored by the Board in the area of career readiness and excels in the classroom. He demonstrates a positive attitude and stands out among his peers as a role model. He takes courses in accelerated math and reading, and maintains principal's honor roll grades each quarter. Cave is a member of the Just Say No Club, Vex Robotics, math team and Mathematics, Engineering and Science Achievement (MESA). During his time participating in MESA, Cave has demonstrated a strength in computer coding and programming. He plans to pursue either engineering or computer science courses in college and hopes to build a Nano-robot that can help in the medical field. Lin was honored before the Board in the area of personal responsibility and is a role model for his peers. He demonstrates personal responsibility in both the classroom and in peer relationships. He completes his classwork and homework on time, and takes advantage of extra credit opportunities. Lin serves as a mediator among his peers and models respectful behavior. He has received the Berry Best award at school and is consistently named to the principal's honor roll. Outside of school, Lin plays baseball and enjoys serving his team as an outfielder, catcher and pitcher. Additionally, Lin loves to read and likes to quiz himself on academics. McPhee was recognized before the Board in the area of academic achievement and models a commitment to his studies. He excels in the classroom and is enrolled in the Scholars Course of Study. Last year, McPhee was among the top nine seventh graders to score a five on both math and reading assessments. He also scored among the top 25 students at the regional Math Counts event, which qualified him to compete at the state level. He is known among school staff as "Mr. Math" and gives 100 percent to his academics. 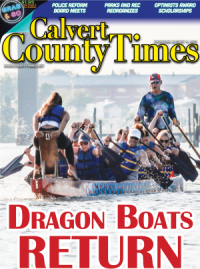 Outside of school, McPhee is an avid swimmer and member of both the Hawthorne and Charles County swim clubs. 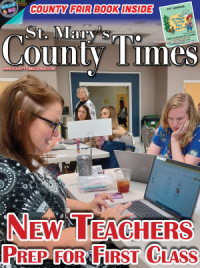 Although he is not set on his future career goals, McPhee is interested in pursuing a possible career that is math, computer or engineering related. Washington was recognized before the Board in the area of academic achievement and is a role model student. She models the three R's at Turner: Respectful, Responsible and Ready to Learn. Washington is viewed by her peers as a leader and a dependable helper in the classroom. She completes all classwork and homework in a timely manner and is an active participant in class. She enjoys reading, writing and math, and likes to work in small groups. Outside of school, Washington is a gymnast and likes to spend time with her family.